In order to achieve anything in life, it's imperative to have a clear vision of exactly what you are trying to accomplish, regardless of whether it's having a cleaner house or figuring out where you want to be in your career in the next five years. Determining your career goals can be rather difficult, as it is often hard to determine who you want to be and where you want to go. This being said, in order to develop a solid career plan, you need to create a vision of what you want to achieve in your career, in both the short-term and long-term. Below are some tips and tricks for defining your career and future success. Set aside a specific time to really think about your future career aspirations. This is a process that cannot (and should not) be rushed, as you will not get anywhere if you don't have a clear understanding of where you want to go. You might also discover that you encounter several "false starts" along the way. Don't let this discourage you; you will eventually figure out what it is that you want to do. Sometimes you just have to be patient. Try to suspend all logic for a second. Rather than focus on the idea that certain things are impossible or out of reach, think about what it is that you are truly passionate about. Your future holds an endless amount of possibilities, and you need to believe that you can accomplish anything if you put your mind to it. Put it in writing. After you have taken some time to think about what the future holds for your career, it is time to write everything down. This will help you to see things in a different light, and it will also help you to be clear and concise when considering both long-term and your short-term goals. Additionally, you should write out the specific steps you will plan to take, as this will help you see what you need to do in order to attain the career of your choice. Make sure to keep your ideas visible. Once you have taken the time to formulate your thoughts and write everything down, it is important that you keep it somewhere visible. It makes no sense to spend time drafting your future if you are going to put it in a drawer or a cabinet and never look at it again. If you place your career vision in a place that you can see it, you will be more likely to refer to it on occasion. This will help you to stay on track, and it can also provide some reassurance in the event you get somewhat discouraged or lose track of your end goals along the way. Review, review, review. 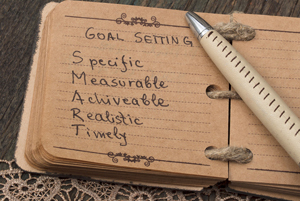 As mentioned above, it is important to review your career goals on a regular basis. You will soon see that these goals will start to shift over time, which is natural. As you gain more experience, you will have a better understanding of your industry and whether you want to continue to progress with your particular job and/or company. You might also decide that the industry you selected isn't for you, in which case you will be able to reassess your career goals and start this process again. Bottom Line: In order to succeed, it is important to set career goals and have an overall vision for where you want to go. In doing so, you will think about the steps required in order to achieve this, and you will be much more likely to attain success in your career.